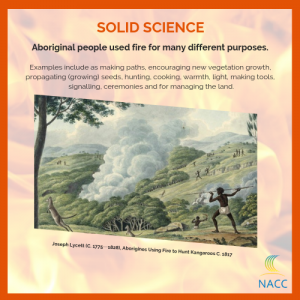 Aboriginal people used fire for many different purposes such as making paths, encouraging new vegetation growth, propagating (growing) seeds, hunting, cooking, warmth, light, making tools, signalling, ceremonies and for managing the land. For example, the Noongar people used fire for smoking out and trapping animals such as possums and to propagate seeds such as those from acacia trees. The Noongar people also used fire to manage the environment through controlled burns. This is evident from markings on trees such as the jarrah tree indicating that Jarrah forests were burned every three to four years, while coastal grasslands were burned every two years. This strategy ensured that fuel that could create large uncontrollable fires did not build up. In parts of Australia, Aboriginal fire management practices are employed to reduce the severity and size of bushfires. One of the ways the Yamaji people use fire is for cooking traditional foods. A kangaroo is cooked by digging a deep hole, making a fire at the base, filling the kangaroo’s stomach cavity with hot rocks, putting the kangaroo in the ashes, and then covering the kangaroo with ash and sand to cook the kangaroo evenly. The Yamaji people also used the heat from fire to straighten branches for making tools such as spears. This practice and knowledge has been passed down from generation to generation, and is still being passed down.